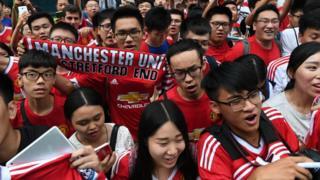 Premier League club Manchester United is to open a series of club-themed entertainment and experience centres in China, the club has said. The Old Trafford club, which has millions of fans on Chinese social media, will partner Chinese property developer Harves to build the centres. The first are scheduled to open in Beijing, Shanghai and Shenyang by 2021. The Beijing centre will be built in the Qianmen Dashilan area next to the Forbidden City and Tiananmen Square. Fans who visit a centre "will be able to experience the thrill of a matchday at Old Trafford" as well as learning about the history and heritage of Manchester United, the club said in a statement. The complexes will also include restaurants and club retail stores. "We first visited China in 1975 and we're proud to have seen our fanbase in the region grow and develop their passion for United over the years. This new concept will allow them to get closer to the club they love," said Manchester United's group managing director Richard Arnold. Harves boss Zhang Bo said the centres would offer a "fully immersive experience that entertains, educates, and inspires the next generation of football fans." The club last visited the country during the summer of 2016. The club's official TV channel MUTV is broadcast to more than 100 million viewers in China thanks to a tie-up with digital media platform Sina Sports. It makes MUTV programming available across numerous digital platforms. And according to China-based sports agency Mailman Group - whose clients include Manchester United - the club has the largest online fan base of any overseas club in China. It says United has 9.3m followers on Weibo, China's equivalent of Twitter, ahead of city rival Manchester City, with 8.3m followers. The club recently parted company with manager Jose Mourinho, and sits sixth in the Premier League. It is still in the Champions League and FA Cup competitions. Manchester United: Have fans reluctantly accepted their team's 'B-List' status?